Advocacy . . . because Mental Health Matters! Raising awareness across Cambodia about mental health, promoting mental health care and psychosocial well-being, and advocating for mental health services in Cambodia is part and parcel of our work. Raising public awareness about mental health is one of the key elements in the prevention of mental health problems and in the promotion of mental well-being. Mental health literacy is Cambodia is low and stigmatization of those with mental health problems widespread, two issues we aim to combat through our mental health awareness raising activities and advocacy. We also strive, through our work and advocacy activities, to bring about positive public mental health policy change and stimulate both the discussion about mental health and the development of a mental health system and infrastructure that can cope with the mental health needs of the Cambodian people. 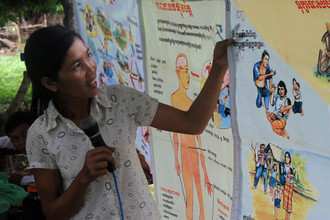 We target a wide number of audiences, using a variety of channels, methods and media to deliver essential mental health services to the Cambodian people. TPO staff during a public psychoeducation event in a village. As part of our community mental health programs, we conduct community-based public awareness-raising activities about psychosocial problems such as alcohol abuse, domestic violence, and the causes of mental health issues. We organize these activities in the communities, pagodas, schools, and other public places and we also use radio broadcasts, video and film. We also have a wide range of information material for distribution to the public, including posters, leaflets, and banners. TPO aims to build a better understanding of mental health in the general Cambodian public and advocates for better mental health services through events, print and online publications, its website and social media, newspapers, radio and TV. Every year, we actively engage in national and international awareness raising campaigns that touch on aspects of our work, such as International Women’s Day (8 March), the International Day in Support of Victims of Torture (26 June), World Mental Health Day (10 October) and the International Day for the Elimination of Violence Against Women (25 November) to name but a few. We are a co-organizer and participant in the yearly Youth Mental Health Day at the Royal University of Phnom Penh, one of the biggest events on the calendar for mental health in Cambodia. Watch the video about this event (and other videos) on our TPO YouTube channel. We also publish a large number of reports on mental health topics, as well as leaflets, brochures and manuals. Check out TPO Publications for more. We develop partnerships and network with government ministries, provincial and local authorities, community leaders and groups, universities and other NGOs to initiate change and bring about mental health policy change. 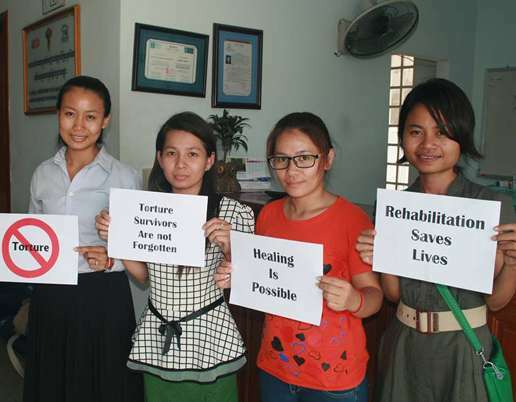 We are also a member of a number of umbrella organizations, in Cambodia and internationally, who are supportive of or aligned with our mission to bring mental health care to the Cambodian people and raise awareness about or advocate for mental health. For more info, check our Partners page.